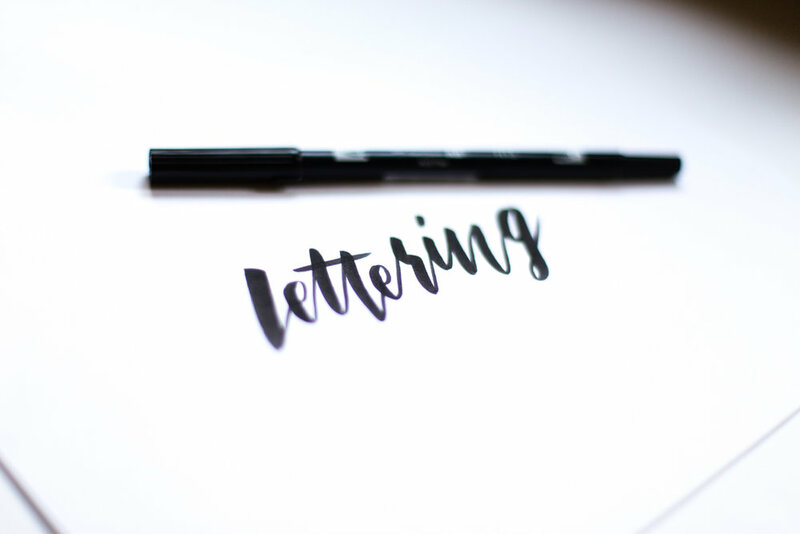 Obviously, you can create these styles of lettering with actual brushes, but there are pens specifically designed with brush nibs that will give you similar effects and are now used a lot in modern calligraphy and hand lettering. All of these pens require some initial learning and quite a bit of practice to get used to the techniques but they all work really well for getting that brush lettering style. Please let me know if there are any pens that you love and recommend too - I’m always on the hunt for new tools to try and faves to find! The Tombow Dual Brush Pens are a classic favourite for many hand lettering artists which you will notice if you have ever looked up hand lettering on Pinterest or Instagram, and they are also one of my favourites. The pen has two ends - one fine-point, hard nylon tip and one flexible brush tip. The brush end has a long, tapered nib which allows you to get large contrasts between thick and thin strokes and creates strong, clean strokes at either extreme. I have found that these pens tend to wear out and fray easily when working on regular printer paper, but I will always repurchase these! I used my Copic Multiliner Brush Pen so much that it is completely worn out and in dire need of replacement! While not as tapered and contrasting in stroke weight as the Tombow Pens, the Copic Pen’s flexibility still allows for stroke variation and creates an extremely smooth writing experience. I bought this pen on a whim while browsing in Gordon Harris and I am so glad that I did! The Copic Ciao pen is another that has two ends - one with a Super Brush nib and another with a Medium Broad nib. While I usually buy all my pens in black initially, I bought this pen in pink because that was the only colour I could find at the time, but it’s one I would definitely purchase in many different colours. This, like the Tombow pen, has a long, tapered nib, allowing for a diverse range of stroke weights, but has a softer, more flexible nib which creates a more flowing stroke. The only downfall of this pen is that the ink is very thick, meaning that on the wrong paper it soaks through and bleeds across creating messy, uneven lines, so it’s important to choose your paper carefully with this one! Other than that, a definitely must-try! The Faber-Castell Pitt Artist Big Brush Pen is another pen that I have been unable to purchase in black, but I have been back and bought several other colours because I really enjoy this one! With a wide, medium-length, quite hard nib, this pen is a fun one to try! The harder nib makes it similar in feeling to the Tombow pen, it’s length makes it feel like the Copic Multiliner, and it’s width makes it unique from the rest. This pen also writes really smoothly, making it a breeze for hand lettering. Just like the Faber-Castell Big Brush Pen, the Letraset Flex Marker gives those chunky strokes, if not chunkier! The twin-tipped pen offers both a broad chisel nib and a flexible brush nib which is short and wide, creating beautiful, strong, thick strokes. Letraset has now merged with Windsor & Newton, so I’m not sure if you can still purchase these pens, but the closest seems to be Windsor & Newton’s Brushmarker which I hope is just a repackaged version of the same thing because I’d love some more! Last but not least is something a little different! Unlike the other pens which have all had solid brush nibs, the nib of the Zig Clean Color Real Brush Pens contains actual brush bristles! This unique difference makes these pens perfect for creating texture or experiencing the feeling of a real brush. I have purchased these pens in many colours and actually use one in a light grey in my current bullet journal set up! 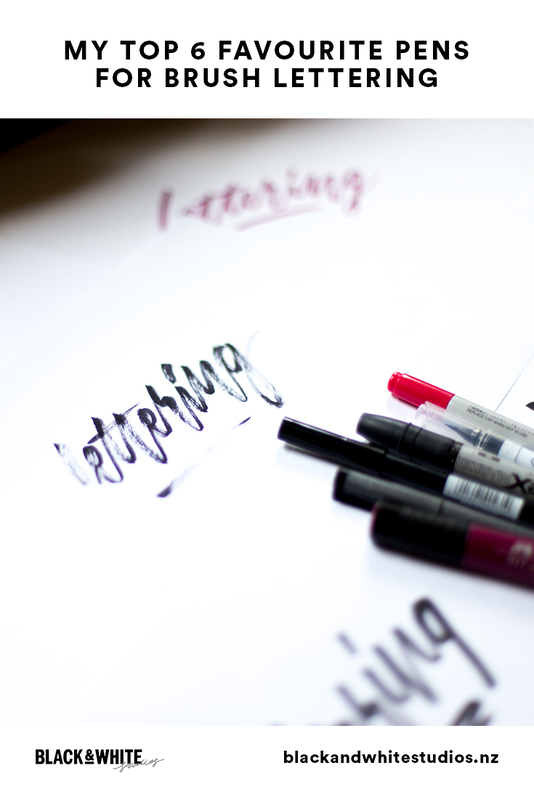 I hope that you have enjoyed learning about my favourite pens for brush lettering and that it is helpful in knowing where to start if you’re wanting to give it a go! Also, don’t forget to let me know your favourite pens! I’d love to hear what you recommend!